The novel has many examples of a kind of needless violence. 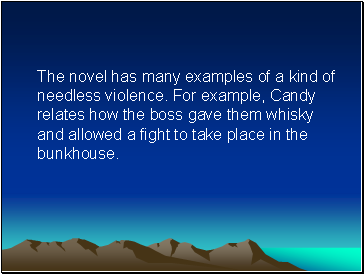 For example, Candy relates how the boss gave them whisky and allowed a fight to take place in the bunkhouse. 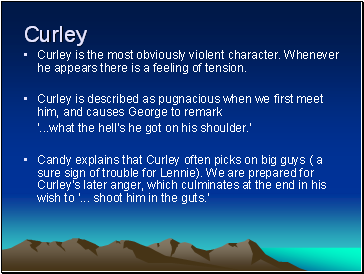 Curley is the most obviously violent character. Whenever he appears there is a feeling of tension. Carlson is another character associated with violence. He is unconcerned about killing Candy's dog (and in fact callously cleans the gun in Candy's presence). Later he is very keen to get his gun to join in the hunt for Lennie. 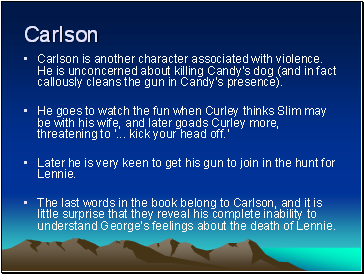 The last words in the book belong to Carlson, and it is little surprise that they reveal his complete inability to understand George's feelings about the death of Lennie. 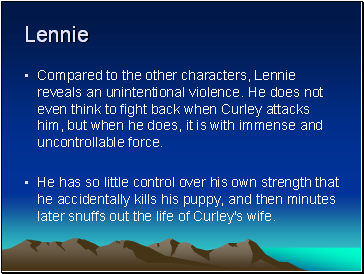 Compared to the other characters, Lennie reveals an unintentional violence. He does not even think to fight back when Curley attacks him, but when he does, it is with immense and uncontrollable force. He has so little control over his own strength that he accidentally kills his puppy, and then minutes later snuffs out the life of Curley's wife. 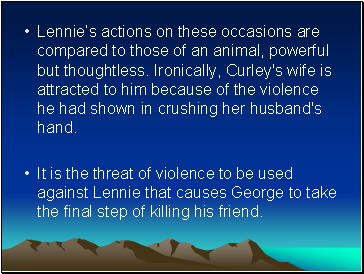 Lennie’s actions on these occasions are compared to those of an animal, powerful but thoughtless. Ironically, Curley's wife is attracted to him because of the violence he had shown in crushing her husband's hand. 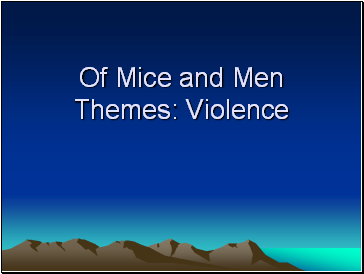 It is the threat of violence to be used against Lennie that causes George to take the final step of killing his friend. Steinbeck shows the world of nature to be a beautiful and peaceful one, but threatened by the actions of men. 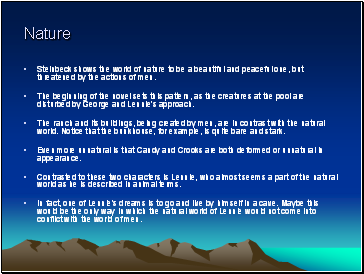 The beginning of the novel sets this pattern, as the creatures at the pool are disturbed by George and Lennie's approach. The ranch and its buildings, being created by men, are in contrast with the natural world. Notice that the bunkhouse, for example, is quite bare and stark.